Circuit breakers are very important machines: they ensure the protection of electricity transport networks. Failure could have serious consequences like loss of services, revenues and also a very high repair cost. This seminar presents 3 examples of tests to analyze a circuit breaker. What are the main subjects? Importance of timing the main chambers of high-voltage circuit breakers. Measurement of dynamic resistance of high-voltage circuit breakers contacts. 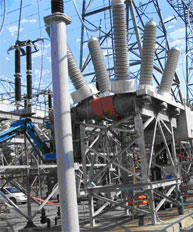 Vibro-acoustic diagnostics for high-voltage circuit breakers. A complete understanding of the importance of planning and structuring the maintenance of high-voltage circuit breakers, based on standards and instruments, validated and approved respecting those standards. Electrical engineer, electrical technician, field engineers, project managers, inspectors, contractors, plant, supervisory and new-hire personal, maintenance engineer, operator or maintainer of circuit breakers and any company with an interest in low, medium and high voltage Circuit Breakers. Location: For event dates and locations. This one day seminar could be organized in your city! (min 10 persons).